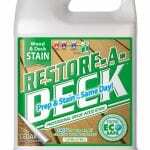 Update for 2019: This is our initial Review of the Restore-A-Deck Solid Color Wood and Deck Stain. This review will be updated over the years. 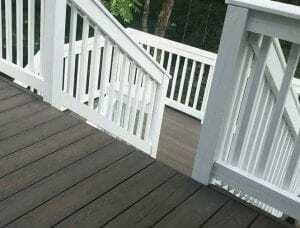 As deck restoration contractors, Restore A Deck Solid Color Stain will be our go-to Solid Color Stain for 2019 due to its ease of use, 5 pre-mixed solid colors (the only solid stain on the market that comes pre-mixed), and the ability to prep and stain on the same day. 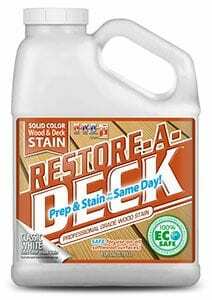 Summary: Restore-A-Deck Solid Color Wood Stain is an extremely durable synthetic-resin, opaque wood finish that helps protect against the damaging effects of water, fungi, and UV radiation on exterior wood surfaces. This V.O.C. compliant water-based product provides exceptional protection for nearly all exterior wood surfaces in a beautiful matte finish. 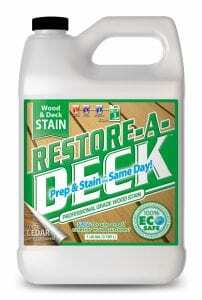 Restore-A-Deck Wood stain can be applied the same day as the prep. Make sure that all standing water has dried off the surface after prep. Typically 2-4 hours at 70º F and less than 50% humidity. Restore-A-Deck Solid Color Wood Stain can be used on interior or exterior horizontal and vertical wood surfaces including wood siding, log homes, decks, fences, outdoor wood furniture, pressure treated and all other natural wood surfaces. – The Restore-A-Deck wood stain color we used was the Solid Classic Color in White for the Railings and Semi-transparent Dark Walnut for the Floor. The two coats applied to our PTP wood covered nicely and did not show any wood grain which is expected with a solid stain. Even application and no overlap lines.